For a deliciously flavorful and delightfully crunchy take on boneless skinless chicken breasts, check out this fun way to use boxed stuffing mix! I pulled this out of Grandmama’s crate of recipes, which are currently residing at my house while I go through them and pull out recipes for my next book. My son is becoming a non enthusiastic meat eater as of late. He tends to gravitate more to veggies (cooked carrots are his favorite) and so when he ate two servings of this chicken, I knew I had a winner. Ricky is a diehard fan of Granny’s Oven Fried Chicken and declared this to be right up there with it. With even less work on my part that is another point in Crunchy Chicken’s favor. All in all, this is a wonderfully crunchy dish with a POP of flavor thanks to the non traditional use of stuffing mix. It comes together in a flash and cooks up while you do other things. All of that means this is a great dish that the whole family (including the cook!) will love! I have a lot I want to talk about in this post. But I realize some of y’all just came for the recipe so if you want to jump right into that just scroll down until you see the photo of ingredients. A few years ago, I didn’t understand e-readers. It just seemed like such an odd thing to curl up with a screen rather than a real book. I had a kindle but it was more a novelty that I eventually passed on to my son. Then, about two years ago I had to fly to California for two weeks. Two weeks! This type of packing required more than my usual carry on and the biggest problem I had was the amount of books I wanted to take. Suddenly, I was batting for the ereader team. Since then I’ve found myself increasingly drawn to them. It is especially nice when I wake up in the middle of the night and can’t go back to sleep. I simply roll over on my side to block the light from the screen and dive into another world. But lately, I find that I’m missing the feel of a good book in my hand. Just as old blue mason jars with zinc lids call out to me whenever I walk by, my chair with it’s blanket draped across seem to be yearning for me to sit down with a book. An actual book. My kindle app has been growing more lonely with each passing day. Just this past week, my husband asked me what I wanted for my birthday (it was yesterday). I gotta give the man credit, that was the earliest he had ever thought ahead. Usually, birthday gifts are considered the day before. I had to think about it a while because that is one of the rare times where I can ask for something and not feel the least bit guilty about it, so I go for pure indulgence. Oh my goodness, they are beautiful. Hardback, cloth covered versions of so many classics. I made out a wish list of the ones I haven’t read in hopes of getting those first. Eventually, though, I’d like to own them all. I just imagine that collection sitting on a shelf in my house and someone coming over and asking to borrow one for the evening and I dream of walking into the room and seeing my daughter with her nose pressed between the pages. These are real books. Not pixels on a screen. You read them and then you can turn right back around and read them again. No rental fee. No pause or rewind, just me, them, and the lands and times they want to take me to. While I was at browsing for myself, I ordered a set of children’s classics for Katy (I actually found them on eBay but that link will take you to see them on Amazon). One of these days, she’s going to be curiously looking through my bookcase and one of them will catch her eye. All she’s got to do is pull it out and crack open the cover and away she’ll go. And return as many times throughout her life as she likes. So, I’m making a conscious decision to start reading actual books again, after having only left them off and on for the past two years. I miss ya, paper smell. I miss the dust. I miss the dog ears and pencil underlines – Yes, I do that. I make them mine. I talk to myself within the pages and make notes to read when I come back to pick up the conversation again. Some of the best parts of my life have always been the tangible ones. And I’m staging a comeback of those. If you like, you can follow the concentrated growth of my book collection on Instagram by following me (click here). Join me by tagging @southernplate on your instagram and using hashtag #yearofthebook. I’d love to see your favorites and finds. In the meantime, I hope to talk a little more about this in a video I’m making after I finish this post and homeschool for the day. I had to take a little time off from videos until I had time to get in to see Daniel, as he was starting to leave messages on my instagram photos regarding the state of my hair :). I love ya, Daniel! You can “friend” the mastermind who has been doing my hair ever since I started doing tv by clicking here if you’re so inclined. He’s awesome and I’d surely look like a picked bird without him :). To begin with you’ll need: Cream of chicken soup, milk, boxed stuffing mix (flavor of choice), and boneless skinless chicken breasts. 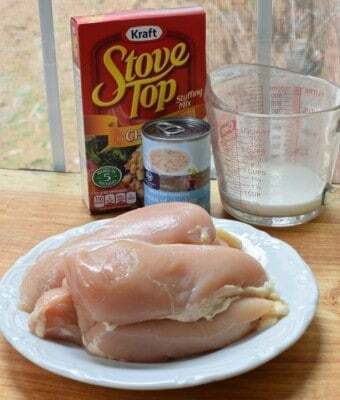 If you prefer, you can use my recipe for homemade cream of chicken soup in Come Home To Supper in place of the canned soup and milk. 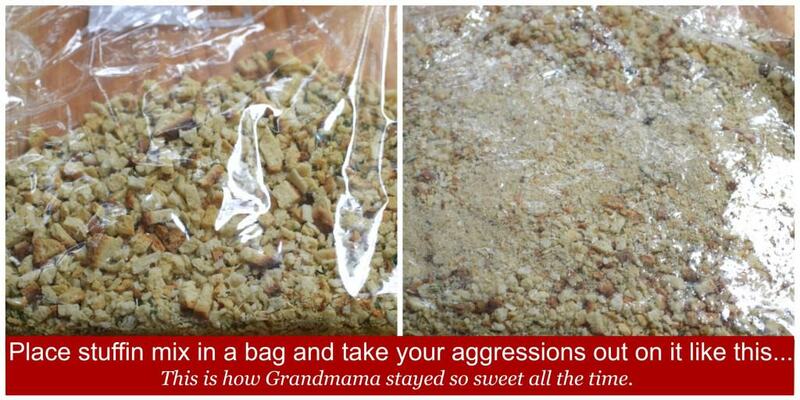 Start by placing the stuffing mix in a large zipper seal bag and beating the living mess out of it. I highly recommend hammering out chicken or stuffing mix or cracker crumbs as often as possible as it helps work out the frustration with the craziness in the world around us – and keeps us sweet :). Stir together the milk and cream soup until well blended. Make a breading station by placing stuffing crumbs in one bowl and soup mixture in another. Then into the crushed stuffing mix, both sides. Place these on a lightly greased baking sheet and bake at 400 for 20-30 minutes. Thicker chicken breasts will need closer to thirty minutes, thinner will be closer to twenty. To check for doneness, just cut in the center of one and pull it apart a bit to make sure there isn’t any pinkness. Serve this hot and crispy chicken as soon as it’s done, with a side of your choice. Mine is featured with Creamy Cucumbers, recipe coming soon! Place stuffing mix in large zipper seal bag and crush with a rolling pin or meat tenderizer (or your hands). 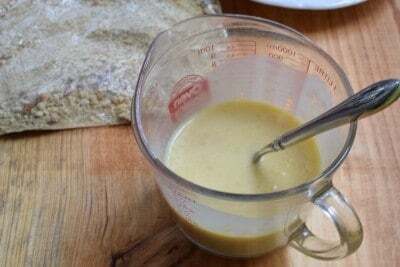 In bowl or measuring cup, stir together soup and milk until well blended. Pour stuffing mix crumbs in one bowl and soup mixture into another. 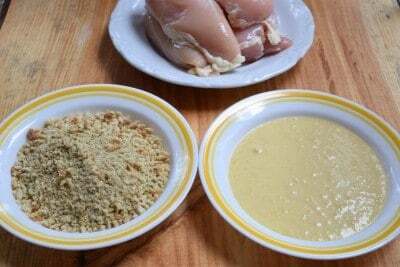 Dip each chicken breast, on both sides, first into soup mixture and then into crumbs. Place on greased baking sheet. Bake at 400 for 20-30 minutes, or until chicken is lightly browned and no longer pink in the center. *Homemade cream of chicken soup may be substituted for the can of soup and the milk. My recipe may be found in Come Home To Supper. As always, I’d just love to hear from you in the comments. You can talk about the weather where you are, this chicken recipe, the cucumber salad on the plate beside it (recipe coming soon! ), my self declared Year Of The Book at the bottom, or, just drop a “hidy!” because it is always a joy getting to hear back from you. Answer Questions : What do you do to be frugal in the kitchen? I also love both my e-reader and hardbound books! 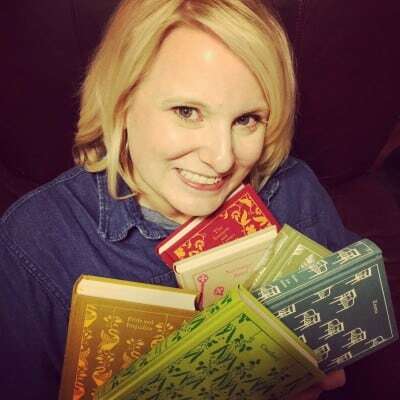 I was thrilled to get my mother’s set of the Louisa May Alcott series… from “Little Women” to “Rose in Bloom.” While growing up, I spent many hours reading and re-reading each one. Now I can start again! Will be sure to try this recipe. My son gave me “Come Home to Dinner” for Mother’s Day and he has liked every recipe we’ve tried so far. Oh my! Kim, you may or may not want to look at this copy of Little Women in the Puffin In Bloom line from Penguin. It is one of the most beautiful books I’ve ever seen. I’m going to post a photo on my instagram later. I’m so glad you enjoy my book and thank you for the honor of being in your home! Thank you Kim, I will have to check out your board!! I love the feel of a book in my hands,too. Even though I do more reading on my iPad because it’s so easy to download the books and carry it with you. I just read “To Kill A Mockingbird” because my grandson’s English class is reading it. He has really liked this book and wanted to discuss it with me. I had to read it to keep up with him,but I enjoyed it. I read his copy from the school library. Now,we are eagerly awaiting Harper Lee’s sequel to come out! You know, I have never read To Kill A Mockingbird but it is on my list. I like having great books to look forward to. I have mixed feelings about her new book, with so many people saying she never wanted it to be published, but I’d love to hear what you think about it after reading! I haven’t pre-ordered it yet, but I will read it. I think that maybe it was found just as Harper Collins and her lawyer described and Nelle (Harper Lee) decided to go ahead and print it now rather than posthumously, or that she always knew where it was and changed her mind about publishing it in her lifetime-after all of the comments, bet she’s wishing that one back! Her late sister, Alice, was still sharp as a tack at over 100. I think a lot of the negative comments are simply sour grapes. They are only discussing senility because she’s 88; at 48, no one would even bring it up, and she could very well be sharp as a tack, and only be in an assisted living facility because of physical problems, not mental ones, but then that’s just my point of view. Maybe it won’t be as good as Mockingbird, maybe it will be, or be even better. We should all just wait until July and see, and enjoy the unexpected gift we’ve all been given. I like “real” books, too, BUT, it’s hard, even after purging 50 years of books, to find room for more, and the big heavy ones are hard for arthritic hands to hold. I really like being able to adjust the font size so I can read comfortably, and I love the backlight on the Paperwhite. Like you, I can turn the room light off, get in bed, read, and not have to get back up to turn the light off. I can also be read to with my old 3G Kindle Keyboard while I am making a rug or cross stitching. The Text to Speech is sometimes really laughable, but I can get through a lot more books that way, and it doesn’t cost extra. I like that. So, after being really resistant to getting a Kindle, you’ll now pry it out of my cold, dead hands. I’ve made this with cream of mushroom soup, which tastes great too! yummy simple recipe. I was going to make your “Granny’s Oven Fried Chicken” this weekend – but I may have to try this recipe instead!! Sounds really good and really easy! I’ve thought about purchasing a kindle paperwhite for convenience, but I just really love the idea of an actual book too! Hmm…decisions decisions! I love my Kobo e reader, mainly because of the lightness of the “book” and the fact that I can carry so many books with me and its only as heavy as the ereader. I sit my twin grand daughters every day, I drive 20 k to get there, and am there from 7am to around 5pm they still have naps so reading is a good way to be quiet, and I can read at odd times without loosing my place. Mmm, will definitely be trying this, as I love chicken breasts and Stove Top Stuffing! I have had a Kindle ereader since they first became available, and I got the Paperwhite when it came out. That is a handy feature! The portability of an ereader can’t be beat and if you have one you can read in the dark, that is another plus. I guess Im just preparing for my life in a small cabin in the middle of the woods with kerosene lanterns and grandfather clocks 🙂 A life like that needs an amazing set of books! have to find a place to file the books and you don’t have to dust them. Hidy friend! The weather here is a little cool and very sunny so we are enjoying it today. Colder temps are headed our way though. I have inherited a 15 year old girl who loves chicken so I’m sure I will be fixing this for her soon. Boy what an appetite that girls has! And I love cucumbers so am looking forward to that recipe as well. Love you and your posts! OMG- I just told my husband the same thing the other day. I want to feel a real book in my hands! I think miss the smell the most and then the page turning. Yes we should make this the year of Books. Go Books!! Can’t wait to try this recipe. Chicken breasts and ground meat (turkey or burger) are the meats I would say I cook the most and I know I can always find great recipes on your site– thank you. As for books, I could talk about books all day. I love, love, love reading and writing as well. I am nearly done with the fifth book in the three pines series by Louise Penny which I highly recommend. The series is great and the audio specifically is wonderful. Audio books are my go to format for reading. I read in braille too and have recently read a few books via downloadable audio and in the past in e-text format but I think because there is no inflection )or very little anyway) with reading a book ine text that there are only a few kinds of things that translate okay that way. Plus with e-text as with a kindle or nook or any e-reader you as you said, are not experiencing turning the pages, and so on. One print page is equal to I think like three and a half braille pages which is why I read on audio the most. A single volume print book can be many volumes in braille. I believe that knowing braille both for reading and for writing is vital as a blind person– for labeling items, jotting things down and so on. The stuff I read in braille are things like magazines, some mail that comes that way, restaurant menus, and cookbooks. It took me forever to switch from reading on cassette tape to reading on CD. I have read a few digital books but still prefer audio books on CD. I love character driven fiction. I read historical fiction, classics, romances, mysteries, a little paranormal here and there. Books are blessings. Love them. Happy Belated Birthday Day!! Hope you had a wonderful day! 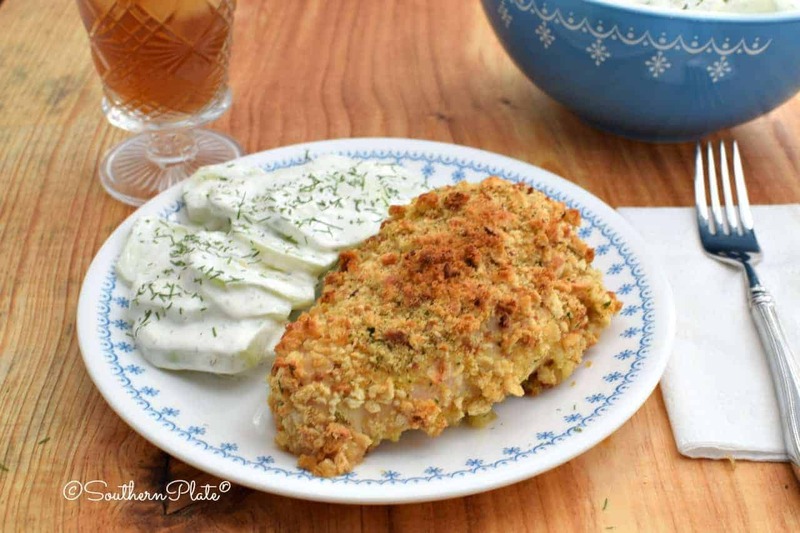 Love chicken…fried in grease on stove top or in the oven. I’m going to have to try this one. I bought an ereader years ago thinking it would be great but I never used it because I was afraid of losing it or breaking it, so it sits in a drawer while I read paper books. I love the feel and smell of old books. I am trying this soon for my guys. They will love it! I have never thought to use cream of chicken soup to coat chicken. Will have to give the chicken breadts a try. They look good. I was a confirmed book worm also but I’ve had my kindle for over a year now and love the convenience. Some books I still read in print version though. I’m in the process of buying old classic books for my grandchildren. I can open one up, take a sniff and be magically transported back to library day in grammar school when I thought that was the most wonderful place in the world! I’ve worn out three Kindles and am now reading on my second iPad. We have a house full of books purchased over 47 years of marriage and even before. We’ve pared every time we’ve moved but physical books tend to accumulate. It’s a balancing act! This recipe sounds great! I’m always looking for easy, good-sounding, great-tasting recipes to fix for dinner after a long day at work. I’m anxious to try this soon! I am a tried and true real book fan. I don’t own one of the e-readers. I like holding a real book in my hands, the feel and weight of it, and the stacks and stacks of books on the floor by my full bookcases. To paraphrase Thomas Jefferson, It’s just not a good life without my books!! I hope you continue to enjoy yours! Thanks, as always, for the great recipes. I am having fun working through your two cookbooks. What’s the side dish in the top photo? Potatoes au gratin, I assume. Is there a recipe? No worries! Good to hear from ya today! My library would miss me if I totally gave up ‘real’ books! I always have about 30 on my wish list there. But, I also love my Kindle … I have about 300 there. I am rarely far from a book. I’d say from a good book, but sometimes I get a non-so-good book. I’ve made a version of this chicken, but instead of milk, it called for cream. I found that to be a bit rich, so I am looking forward to your version. I think it will be ‘just right’. I am a cross stitcher, and I once had a class with a sampler that paid homage to Thomas Jefferson. Instead of the quote that designer used, I used “I cannot live without books.” It fit my family. 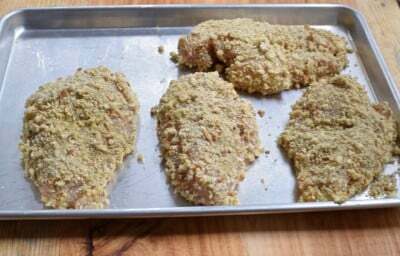 The first meal I made for my husband after we got married was fried (boneless) chicken using crushed Stovetop as the coating. My thinking was “hey, it should be good – it’s already seasoned!” He took one look at it and said “What is it?” I told him it was chicken. LOL! My poor country hubby says “I’ve never had chicken like THAT before!” He was pretty picky in those days -has gotten and lot better since 🙂 – but I love to tell that story on him. Hi Christy! I have a Nook. I also prefer holding a book and reading a book rather than a Nook. I like using a Nook when traveling which I don’t do a lot. You must get WHERE THE RED FERN GROWS for your daughter to read. You may also enjoy reading it too! I love chicken. Never been infatuated with stuffing but am going to try your grandmother’s recipe! My cookbooks are suppose to be delivered by UPS today. Where the Red Fern Grows made me cry….wonderful book. My wife is now on a boneless chicken kick so this will be on the menu next week. I made something like this not long ago and used a new soup from Campbell’s call cream of chicken and mushroom soup. What a great idea. Started on a reading jag back in 2006 and have barely missed a day since. Christy, I have to say a big thank you for all your recipes. It just struck me as I was looking at those pictures of your hand dipping the chicken: “This part of the job is always SO MESSY (and yucky), and here Christy is dipping, holding a camera, probably washing her hands every 7.3 seconds going back and forth between the two, JUST so she can give us these amazing picture tutorials. How much she must love us all!” The chicken looks fabulous! 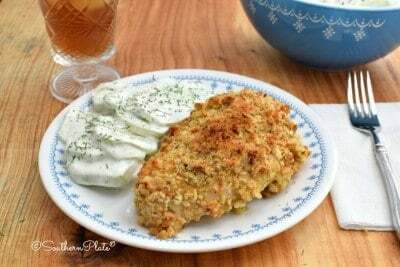 Christy, thanks for this recipe, can’t wait to try it, but tonight for supper I am using boneless pork chops along with the pork stuffing mix and using cream of mushroom soup. I am an avid reader of books that I can hold in my hand. My nightly sleeping pill is a good book. I have just finished reading several series of books by Dee Henderson. I use and participate in an online book store called Paperback Swap. Once you become a member, you have access to about 5 million books. That number includes all kinds of books . You can spend hours just going through what you are interested in and reading the synopsis. When you find a book you want, click it and the person who has posted it will mail it to you. A visit to the website will be beneficial. As for me, I really like the convenience. I am eagerly looking forward to your new cookbook. At most meals my husband wiill ask, “Is this Christy’s recipe”? What a wonderful concept, I am definitely going to have to check it out!! Thank you so much for sharing the information with me!! Hi Christy, Can’t wait to try to make chicken. My daughter is coming home from college this weekend and I am going to plan to make this chicken. She is a stuffing queen and I think she will appreciate this meal. I do want to say also that I am a book in the hand kinda girl do not like the computer books. I want to feel the book turn each page and see it. I love love buying books and never do I feel guilty of spending money on books, magazines etc. I love reading and going to new and different places in my head. Thanks for sharing with us about your book love. My mom was a librarian and my dad a minister and college professor who had more than 10,000 books so I grew up reading. In fact we didn’t have a TV and I never got one until I was 31 years old. I must have a thousand or more books of my own but I have found use for ereaders without feeling like I’m cheating on paper! I borrow online books from my local library and have them delivered to the kindle reader ap on my ipad. I also joined an e book subscription service for 8.99 a month where you get unlimited online reading for that price. I do feel like my retention is waaaaay better when reading a physical copy of a book but I think there is a place for ereaders as well. I have a kindle firehdx and also a nook but have found it just as easy to use their aps on my ipad. I absolutely agree. I will probably always use that app from time to time, as long as the internet and grid holds up at least :). What rich upbringing you had – in more ways that one! Thank you for letting me know about the books Lee, I can’t wait to check them out! =D Richard Peck was our favorite Read Aloud author during our home school days. Just thinking about those books make me giggle! I have an author that I like: Laura Childs. She does mystery books. Kind of a Nancy Drew for adults. 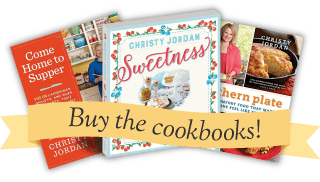 She does: Tea Shop Mysteries, Scrapbooking Mysteries, and a mystery series called, Cackleberry Club ( one of which is called, “Eggs Benedict Arnold”). I think you would like them. Took a book (with three stories in it) when we went on our cruise. You’ll have to check them out! I will have to check those out Angela!! Thank you for letting me know about them! Isn’t it wonderful we live in a place where it is possible to have both e-readers and tactile books. I wouldn’t take any amount of money for my grandmother’s copy of “Girl of the Limberlost” by Gene Stratton Porter, and yet thanks to my Kindle, I have been able to read other books by the same author for free. I am so gratefu to have grown up in a family where I watched my parents read, heard my parents read to my brother and me, and was taught to value all the gifts a book could bring! We are blessed indeed Marynell! !